Are you among those set of people who underestimate the importance of seatbelts? It’s time to know that seatbelts are required because it saves lives. Incase you are involved in a collision and you are not wearing seatbelt, you are 18 times more likely to die than the one wearing the seatbelt. How seat belts protect us? A typical seat belt consists of a lap belt, which rests over your pelvis, and a shoulder belt, which extends across your chest. The two belt sections are tightly secured to the frame of the car in order to hold passengers in their seats. Always use both the belts for better safety. How to wear a seatbelt properly? You should wear a seatbelt properly for full protection during crash. Pull the lap belt across your lap and pelvis area. Never buckle the seat belt across your stomach. The shoulder belt should be snug across your collarbone and chest. Do airbags replace the need for seatbelts? Seatbelts and airbags have entirely different functions. 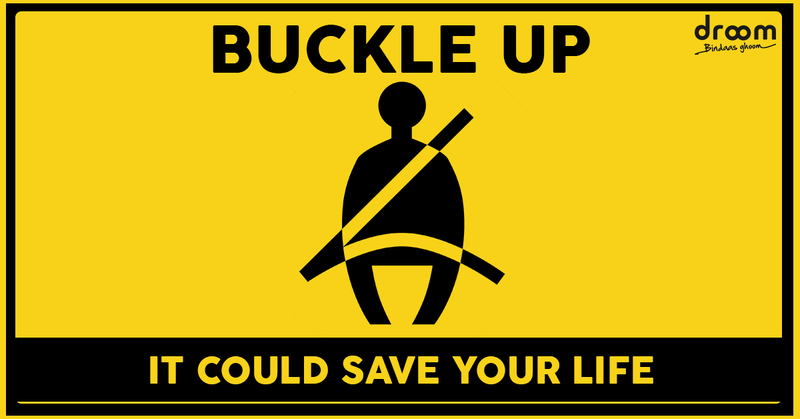 A seatbelt is designed to lock in place when a sudden force is exerted against it. Whereas the airbag increases the length of impact that may occur between an occupant and the interior of a car. By increasing the impact time, the energy of the impact dissipates and therefore reduces the severity of the injuries to the person. The two features work in conjunction to ensure the body is held in the correct position and protected from collision. I hope this article convinces you that wearing a seatbelt saves your life. Though it is irritating to wear the seatbelt during long rides, but it is vital. Even if you are a driving expert it is important to realize that your actions don’t just affect you, but others, too. Therefore, whenever you’re on the road, make safe decisions. Droom India’s Biggest Car Mela is Now Live! I similar to the precious facts you present on your articles or blog posts.I will bookmark your blog site and inasteigvte once more listed here on a regular basis.I am very convinced I’ll gain knowledge of plenty of recent stuff proper listed here! Good luck for your up coming!